Package: In a saucepan bring water to a boil. Package: Add tub margarine an salt if desired. Me: Yuck, tub margarine? How much? Salt is a must. Me: Once again how much? 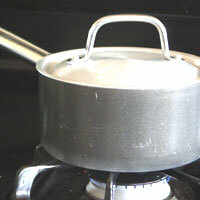 Package: Cover, reduce heat and simmer for 20 minutes or until all water is absorbed. Me: 20 minutes over direct heat will usually burn the rice on the bottom. You don't want to remove the lid to make sure the water is all absorbed. This lets out valuable steam. You need accurate measurements, temperatures, and times. 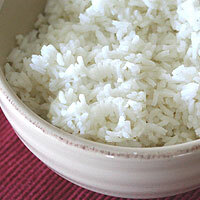 On our rice cooking journey we've tried rice cookers, steaming, simmering, baking, and boiling. We've finally found a method that cooks perfect rice. No more mushy, gummy, slimy, over or undercooked rice for us. At least until I start experimenting with other types of rice. Assemble and measure all of the ingredients. It is a quick process and you don't want to burn anything while you are away measuring. 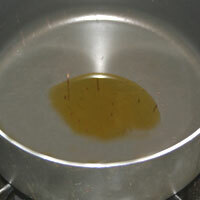 Heat the olive oil in a medium saucepan over med/high heat until it is shimmering but not smoking. Add the rice, stir well and cook 1-2 minutes. Adding the rice to the oil before adding the water coats each individual grain helping them not stick together. It also speeds the cooking process. Don't cook too long or it will taste a bit fried. Increase heat to high and add the water and salt. Stir briefly. Bring to a boil. Cover and reduce heat to the lowest heat. I have a settings 1-9 and a low setting below the 1. I use the 1 to cook the rice. Cook for 15 minutes. Turn off the heat and let it sit for 15 more minutes. Do not remove the lid or stir at any point! Stirring makes the rice starchy and sticky. Removing the lid lets out steam that is needed to fully cook the rice. Fluff the rice gently with a fork. A fork won't smash the rice as easily as a spoon will. 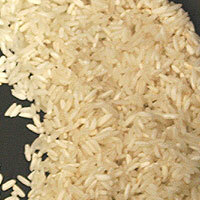 -Heating the oil to a smoking point will give the rice a fried taste. -Cooking the rice in the oil too long will burn it or make it taste fried. 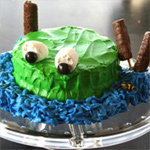 -Adding too much water will make it slimy. 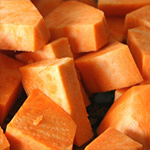 -Overcooking in the right amount of water will dry it out. 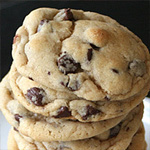 -Overcooking in too much water will make it mushy. -Undercooking will make it crunchy. Heat the olive oil in a medium saucepan over med/high heat. Until it is shimmering, but not smoking. Add the rice, stir well and cook 1-2 minutes. Adding the rice to the oil before adding the water coats each individual grain helping them not stick together. It also speeds the cooking process. Don't cook too long or it will taste a bit fried. Increase heat to high and add the water and salt. Stir briefly. Bring to a boil. Cover and reduce heat to the lowest setting. I have a settings 1-9 on my stove and a low setting below the 1. I use the 1 to cook the rice not the low. Cook for 15 minutes. Turn off the heat and let it sit for 15 more minutes. Do not remove the lid or stir at any point! Stirring makes the rice starchy and sticky. Removing the lid lets out steam that is needed to fully cook the rice. 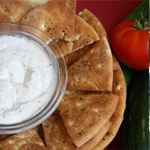 Don't half or double this recipe the first time you make it. Make sure you get it how you want it before changing the quantities. Rice is very particular. 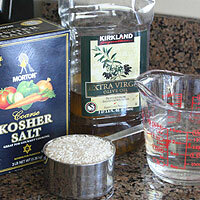 Use only long grain white rice in this recipe. 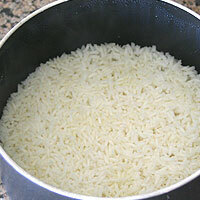 Other rices have longer or shorter cooking times and need more or less water. 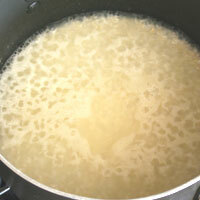 It's fine to substitute chicken broth for the water, or add dry spices to the hot oil. Don't add any extra liquid such as minced garlic or jalepeno. It will change the finished rice.